Ice cream lovers gather around to watch a demonstration of hand-cranked ice cream being made at Billings. Sunday, July 19 at 10 a.m. — WOODSTOCK — Billings Farm & Museum will celebrate National Ice Cream Day on Sunday, July 19 from 10 a.m. to 5 p.m. Visitors can participate in making and sampling hand-cranked ice cream made from Billings Farm milk and cream several times during the day, while learning the history and science of the “great American dessert.” Horse-drawn wagon rides will be on-going and children may join in making an ice cream cone headband and playing 19th century historic games. Admission to National Ice Cream Day includes all programs and activities, plus the operating dairy farm, farm life exhibits, and the restored and furnished 1890 Farm House. 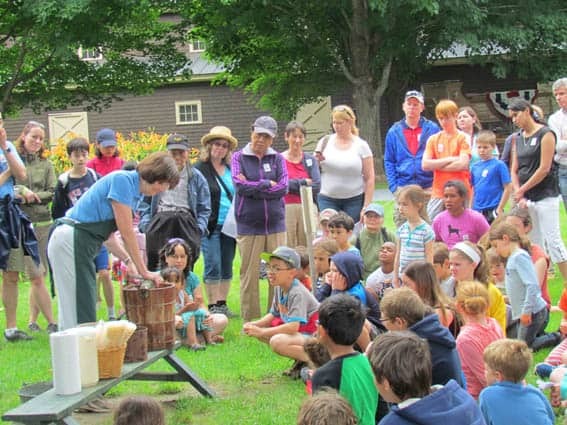 Billings Farm & Museum is open daily from 10 a.m. to 5 p.m. For information about programs and activities contact 802-457-2355 or www.billingsfarm.org.